“It was a dark night. A blood red full moon was hanging in the sky. We were standing on a beach, waves gently lapping in the background. I was one of a circle of 12, maybe 13 women. We were all dressed in black and a sense of awe and reverence washed over me. I felt spellbound and hardly dared to breathe. The old woman stirred the dark liquid in the ‘cauldron’ in front of her and she filled a huge round goblet with a deep dark red fluid. She held the glass high and the light of the moon reflected off the sides. She handed the glass to the woman in front of her, who took it with both hands. As she threw her head back, I could see the clear shape of her taut throat and as the liquid flowed down her throat, I became a part of her memory and her story. This happened with each and everyone of the women in front of me – as she drank the liquid, I became one with her, I merged with her memories and our stories were joined. I was the last one in the circle, being the youngest, and as the old woman handed me the goblet, she said to me : Drink the Poison and Find the Cure!’. I was thirteen years old and lying on my bed with the yellow flower wallpaper next to me. I opened my eyes and returned from this vision. I had no idea what it meant, but from that day, it became my vision and purpose. And slowly, as I returned to the Otherworld, over and over, the answers were given to me and I was guided to the next step. 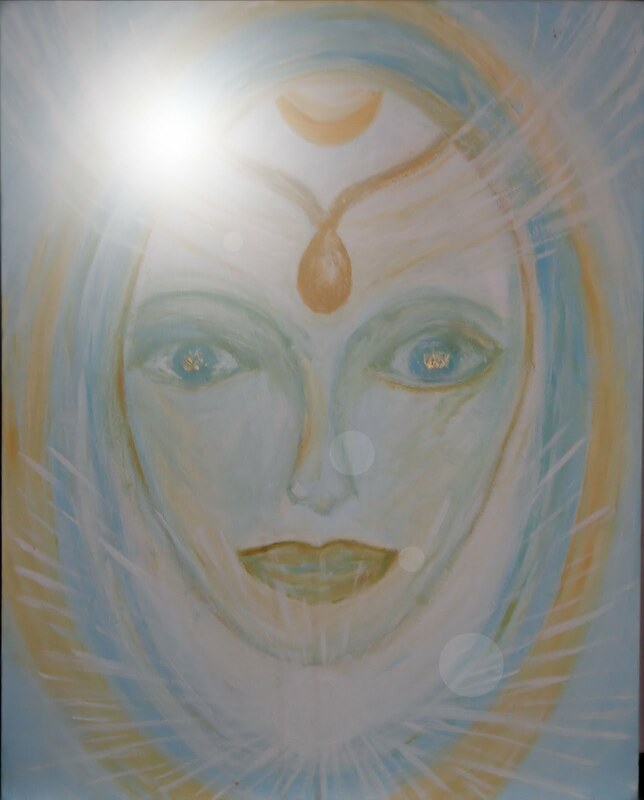 I shared this vision of mine at the International Goddess Conference that I hosted in South Africa in 2008, believing that this was the culmination of Her Call to me. Little did I know that the journey up till then was only Her preparation of the Way of what is still to come! For many years I was happy to teach from many different spiritual writings, such as A Course in Miracles, the Gnostic scriptures, the Bhagavad Gita and so on. The deeper I entrenched myself into meditation and other spiritual practices, the more I discovered a gaping contradiction and inner conflict within myself. In my practical work as a spiritual healer and alternative practitioner, working mainly with women, I found this same inner conflict reflected back at me. We, especially as Western women, living in our current, modern world, had at this stage of our journey, not had the luxury or privilege of asserting ourselves emotionally and spiritually. Nor have we had the privilege of having been received by the world as having the right to assert ourselves spiritually and emotionally. And here we are, now embarked on a spiritual path which once again, is demanding of us to suppress and repress and to let go of this assertiveness. We are being asked to put others first and ourselves, as women, last. We are being asked to let go of our undeveloped ego and already non-existent personal boundaries. On the one hand, I felt compelled to embrace these spiritual teachings as they somehow seem to resonate in my memory banks, but on the other hand, I found myself counselling women to do exactly the opposite!! Time and time again, I found myself advising women to claim their lives back. To put themselves first and foremost, to become strong and selfish parents to their inner children, to fight for what rightfully belongs to them. As my inspired words became more and feminist in nature and virtually the opposite of what I, up till then believed, and were desperately trying to practise, I started to glimpse the incredible conflict within my psyche and entire being. It felt as though I was embattled between that which I have been ‘taught’ for lifetimes and that which naturally arises within my feminine self. I tried to digest and assimilate these teachings as they flowed from my deepest awareness and understanding. It was as though these concepts were an organic part of myself as a woman. I tried my utmost to reconcile these powerful living concepts with the mental understanding of the spiritual path that I believed I followed. But the conflict worsened as I observed women’s psyches and inner worlds flowering and blossoming into healthy bodies and clarity of purpose and sense of self, as they applied these inspired teachings that I shared with them. At a deeper level, a more subtle and more powerful conflict was raging. Not allowing myself to pay attention to this subtle war raging in my own subconscious, I was urged from within to undertake a sabbatical from my wisdom and healing school and to undertake a journey into the unknown depths of my feminine soul. And so started my descent, and like Inanna, I shed the seven layers symbolically through the next seven years of abstinence of teaching, counselling, healing and writing. 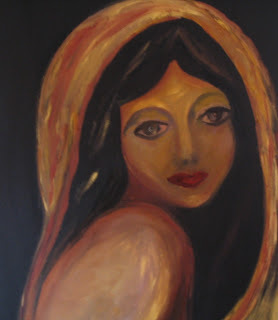 I finally listened to the urge to pick up a paint brush and a canvas and the images were born through me – I was possessed by the daimon of Her Voice – the images that were crafted by my hand were all of Mother Mary. I was never raised Catholic and had no real knowledge of Mother Mary as an image or as the Divine Feminine. Within two weeks four images of her stared back at me, Mary the Queen, Mary as the Lady of Grace, Mary as the Moon, Mary as the Gnostic Sophia, then followed Mary Magdalene and more and more. I felt an intense call to undertake a pilgrimage to get to know Mary better and through many signs I was led to the sanctuary of Archangel Michael for his festival in the ancient village of Monte Sant’Angelo in Italy. I travelled to the sanctuary of St Michael, San Michelle and during my travels in Italy, I found the soothing re-assurance in the image of the grieving blessed Mary and the suffering St Clare of Assisi. I found a deep sense of reassurance and hope in the images of these suffering women, not realizing that the anguish and suffering of my own feminine self found a sense of acknowledgement and acceptance in these images reflected at me. That deepest, unspoken, unacknowledged, repressed feminine self, found solace in the stories of these female Catholic saints and mystics. She found a new sense of hope of having found a voice, of being acknowledged and recognised as Sacred. She had given the Call and it was up to me to answer. And thus started the resurrection of my own feminine divine self.